The physics colloquium speaker, Dr. David Yu, CEO, DULT Research, presented a history of his emigrating to the US and his early student days and how he transitioned from student to professor to working in industry and then to an entrepreneur with his own business. This was a great pep talk for the students to keep studying and enjoy the journey and find some interesting and fun stuff to do. His exhortation that "there are no shortcuts" when it comes to studying physics and everything is necessary, especially hit home for me. I have had a tendency over the last 3-4 years to skip some sections of the physics study because it got too hard or I didn't understand it at the time. But now I have to go back and try to fill in those missing gaps. Just this week, I discovered again that since I had skipped over a good understanding of Hamilton's equations of motion and the connection to Boltzmann mechanics, that I had to go back and reread portions of classical mechanics to fill in gaps that regular physics students would have completed early in their junior year. Anyway, Dr. Yu certainly has led a good and exciting life and he still has a fun, friendly and exciting personality. He also mentioned one new accelerator technology, called Wakefield acceleration using plasmas to greatly increase the energy possible in linear accelerators, that he is doing some consulting on. See the separate discussion of Wakefield acceleration from the SLAC website. It seems that the target particles sort of ride the plasma waves, much like a surfer, and gain extreme energy by doing this maneuver. If the energy added per foot of linear accelerator can be increased say a 1000 times, then very high energy accelerators can be built on a table top instead of in a two mile tube. I had not heard of this new technology before and has always assumed that new high energy accelerators would be circular arrays, like at CERN, but now will have to follow up more closely on this new technique. Back to the upcoming Falco Heavy launch, you probably have been following the news about the upcoming first launch scheduled for February 6. 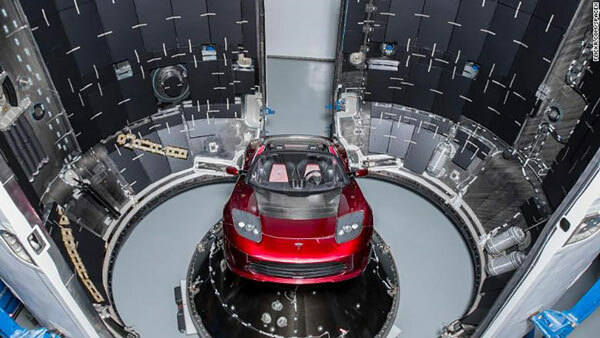 Check out the photo below which shows a red Tesla in the payload area of the Falcon Heavy. Ok, they might also launch a few other satellites too, but hey, what else would Elon Musk choose to send into orbit on this first test launch of the Falcon Heavy? 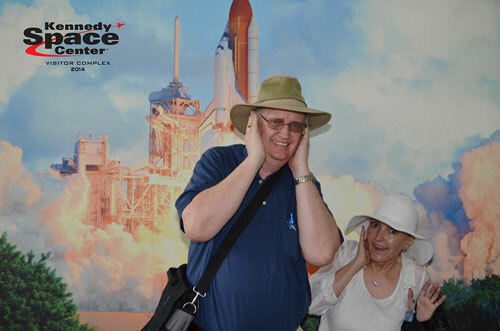 Well, Resident Astronomer Peggy and I have been dithering for several days now about whether we should travel to Kennedy Space Center and get as close to the launch as possible to see and hear and feel the fire and roar of the rocket. But, by the time we decided that Resident Astronomer Peggy would not be going because of the risk to her ears and hearing, all of the closest viewing tickets were already sold out. Remember that in our last post, we mentioned the alert, provided by OCA Tom Munnecke, that February 6 was the anticipated date, but that nothing formal had been announced. Anyway, we choose not to take the risk of buying tickets then. Check out the photo below from April 2014 where Peggy and I pose in front of a mural and I cover my ears to limit the noise and prophetically enough, Peggy is trying to hear better. As it turns out, she just can't risk any further loss of hearing and will not be going to Florida. But, after hearing that OCA Science Nerd and Theatre Impressario, Scott, was going to go, I decided to follow along and we will fly and meetup there in anticipation of being at our first rocket launch. Scott went so far as to calculate the distance between the closest ticketed spaces, which are all sold out, and the location near the Rocket Garden, where we have tickets, and found it is about 7.5 miles from the launch site, in lieu of the close up site which is just something like 3.5 miles. So if the heat and light intensity and the sound intensity decrease as the squared of the distance, we will only get about 1/4 of each. But keep in mind, that when it comes to sound, being twice as far away from the noise source, the sound level only decreases by 6 db. It is still going to be a great experience. That is if the launch goes as planned. We will have to wait and see and hope that we can bring back a great experience and not just a couple of used airline tickets and a bar bill! Ok, enough of dreaming and worrying if the launch will go or not, let's review some preliminary spectroscopy measurements taken in the last couple of days. 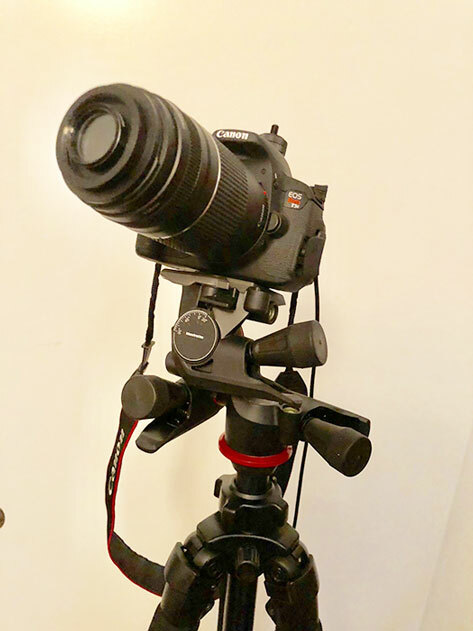 Not that it takes me a long time to get going on some project, but I first acquired a Star Analyzer 100 diffraction grating for DSLR, way back in April 2014 and had only tried in once briefly about four years ago. I attended the Society of Astronomical Science conference in Ontario, CA at that time and heard Tom Field, President, Field Tested Systems, describe how amateurs were conducting spectroscopy with this simple low cost attachment. Tom, even after four years now since we first met, graciously held my mouse and helped me work my way through the software installation. Thanks for that, Tom! The software includes some excellent video tutorials to help the beginner get through it all. Ok, like most spectrometers, you need some type of calibration source to identify how to convert camera pixel locations from the diffraction pattern, which shows up on your DSLR camera image, back to actual wavelengths of light. To do this with the SA-100, it is recommended that the first star imaged should be at Type A star, which has pretty large hydrogen Balmer lines. I chose Sirius at my first test star for this calibration. In the screenshot below, the left image shows that portion of the DSLR frame that has the grating spectrum. The star Sirius is the dot on the left, which if you recall from your optical diffraction theory, represents the 0th mode though the grating and the 1st mode shows up as the typical colored spectrum. The orientation of the grating is not critical because the software allows you to rotate the image until it shows up in this sort of standard way of displaying the frame. Now the panel on the right shows the amplitude of the spectrum and overlaid on top in blue are the hydrogen Balmer lines. 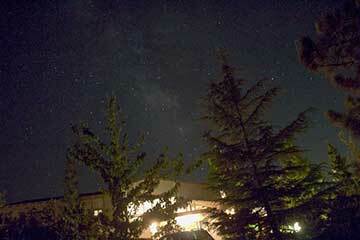 To perform the calibration, I set the pixel location associated with the star image as the location of the 0th mode. Then by examining the amplitude plot, you can spot some dips in the amplitude which are caused by the Balmer lines absorption. So once you assign these two data points, the rest of the wavelengths are assigned in pure linear fashion. I still find trying to identify the right light dip in the spectrum with some particular Balmer line a little bit of a guess. I guess I will need to get some more practice. The next day, I took one spectrum of the sun and tried to do the same calibration trick. 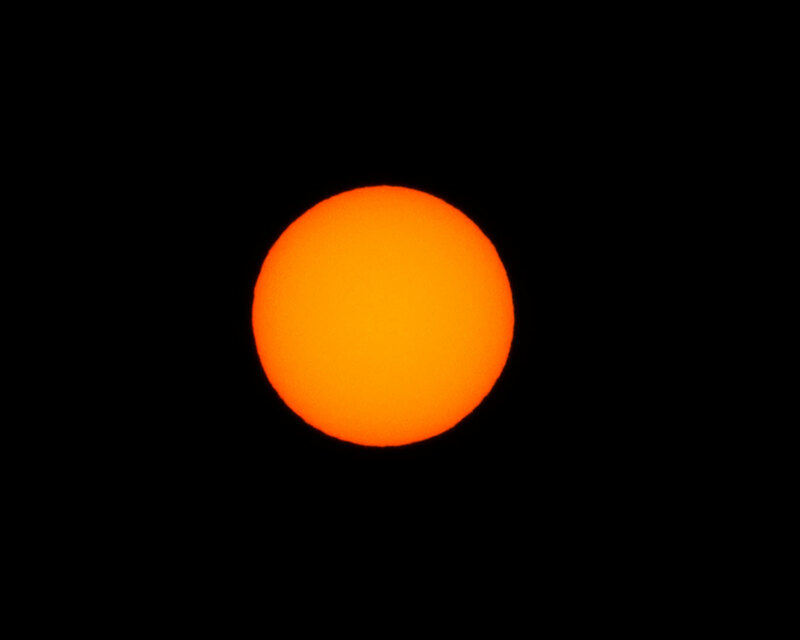 This image was taken with the SA-100 still in place and a neutral density solar filter was placed over the front of the lens. Check out the spectrum below. Well, I could not find any dips in the amplitude spectrum and just took a guess that the peak in the solar spectrum would be close to the wavelength peak of about 6500 angstroms. Then just to establish some baseline condition for the sun, the following plain neutral density filter version, without the grating in place, was taken. It looks like a pretty quiet sun without any sunspots! Finally, I couldn't resist pointing the camera at the moon and taking a spectrum. The screenshot shows the details. The moon is illuminated by the sun, so the incident radiation will have the same spectral characteristics as the sun. The amount of reflectance will change depending on how well the moon reflects light of various wavelengths. Again, I just guessed that the peak in amplitude corresponded to about 6500 Angstroms. Spectroscopy lesson #1. Using the SA-100 and software is an easy way to get started. Spectroscopy lesson #2. It seems that as long as the lens focal length doesn't change, the pixel to wavelength scale factor will not change. So, if during an observing run, you capture one calibration type A star, then the other stars in your observation list can be analyzed with that same one calibration point. I assume that the camera focal length should not be changed during this sequence because the grating dispersion scale factor is some function of distance from SA-100 to the camera sensor. This way would let me calibrate on one good star and then measure the spectrum from the moon or some other object, like a galaxy, and rely on the first calibration to get the right wavelengths for the target object. Spectroscopy lesson #3. If all of this is correct and given how the software lets you move around and rotate the camera image to line up a spectrum for analysis, then you can probably do multiple star spectrum measurements from just one image. So, one of the next planned observations is to take a look at all of the stars in the image and, if the spectra don't overlap, see if it all makes sense.